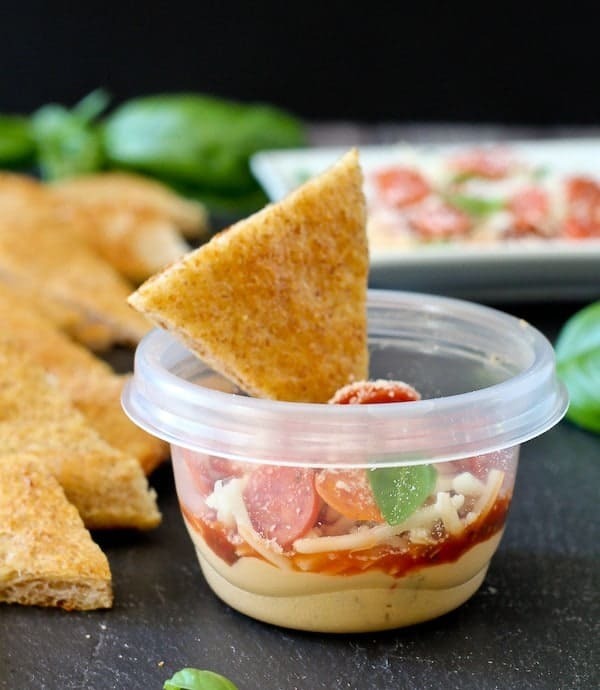 This Pepperoni Pizza 6 Layer Hummus Dip is not only great for parties, it’s also perfect for school lunches! There is only one thing better than dip and that’s LAYERED dip. If there’s a gathering, party or get-together, you’ll find me by the dips. I really can’t resist the classics – hummus, spinach dip, queso, guacamole, french onion dip, or dill dip for vegetables. Basically I love anything I can stick a cracker, piece of bread, or a vegetable in. 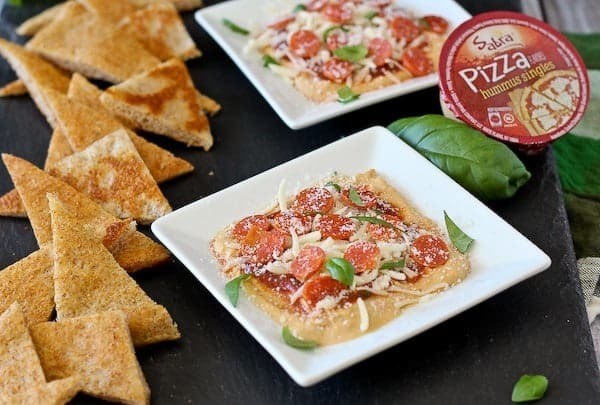 When Sabra asked me to create a recipe with their new Pizza Flavored Hummus Singles (yes, you read that right – a dream come true! ), I decided to keep it as a dip, but jazz it up a bit. With back-to-school season right around the corner (but we are NOT going to talk about that any more!!! ), this dip is perfect for lunches too. So, back to hummus. My little man is not allergic to sesame seeds unless he eats them (his allergy is not an inhaled-type), so we carefully (verrrry carefully) enjoy hummus from time to time in our home. 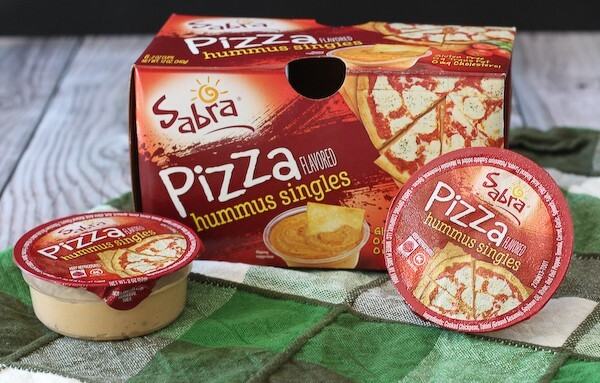 I love this new flavor from Sabra – it has all the great flavors of pizza but with the punch of protein that hummus offers. It’s available in the single size which makes it perfect for lunches. If you want to make this recipe for parties, just get out a little spatula and pile the contents of the single size hummus packages up on a serving tray. Let’s get down to business and talk about the layers! Hummus, duh. Spread it into a nice smooth layer. Pizza sauce. You can buy it or make your own. Pepperoni. I used miniature ones, but you could cut up regular sized sliced pepperoni. Fresh basil! Because it’s actually growing in my garden! If you’re feeling like you need a few more layers, some vegetables would be great. Chopped mushrooms, red bell peppers, or chopped spinach would be good choices. Alright folks, that’s all I have to say. Go get your dippity dip on with this 6 layer hummus dip. On a small plate or a bowl – layer all ingredients. Begin by spreading hummus on the bottom. Spoon pizza sauce over the hummus. Sprinkle with mozzarella cheese, mini pepperoni, and parmesan cheese. 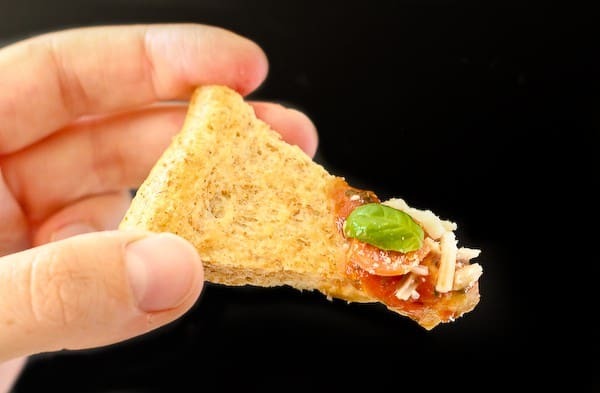 Add basil immediately before serving with pizza crust triangles. Verdict: Loved this fun dip! Looking for more great dipping ideas? 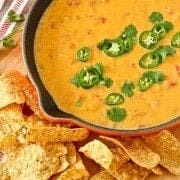 Try: Roasted Cauliflower and Cheddar Dip, Hot Caprese Dip, Broccoli and Bacon Beer Cheese Dip, Hummus Spinach Artichoke Dip, Healthy Mediterranean 7 Layer Dip from Cookin’ Canuck, or Hummus Wing Dip from Sabra. As always, I have a Pinterest board devoted to dips if you’re still looking for more ideas! I’m always updating it! 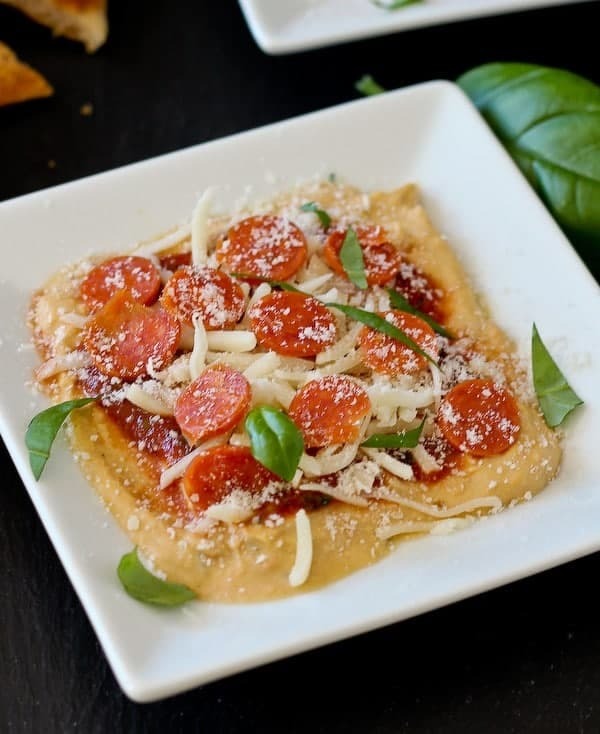 Layered dips really are the best and the new pizza flavor is so darn good! There may not be any kids in this house, but those singles are still a fave! This is so much fun – can’t wait to surprise our girls with this in their school lunch boxes!! 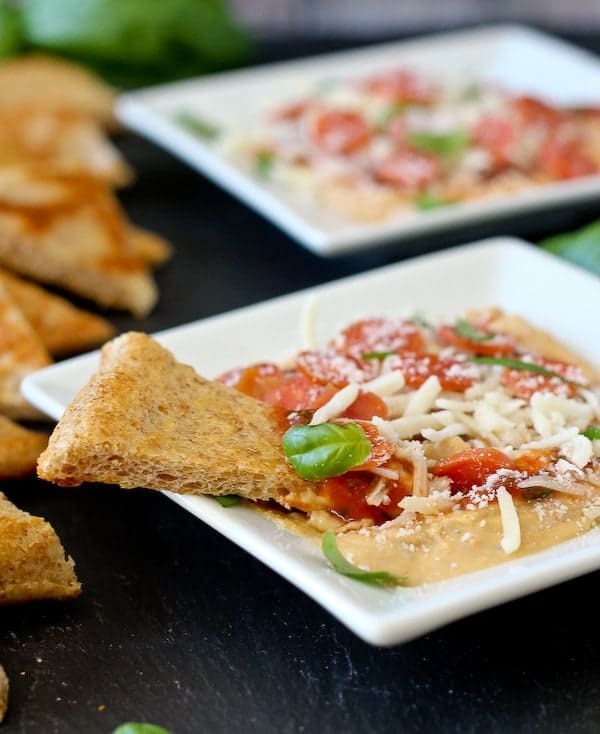 Turning the pizza hummus (which is amazing anyway) into a layered dip is brilliant! Way too fun! I could definitely this whole dip for dinner! Well now this is just fun! I need to go find that pizza flavor to try! Plus I think it’s clever to swap out pitas for the pizza crust to dip. 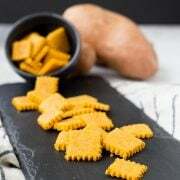 How could I not fall head over heels for a snackable dip!! Because me and pizza flavored things are BFFs! OMG this does sound ridiculously good!! Those layers. The servings in cups. Your photos. All awesome. I think I would devour this dip all by myself in minutes. I just added this hummus to my grocery list! 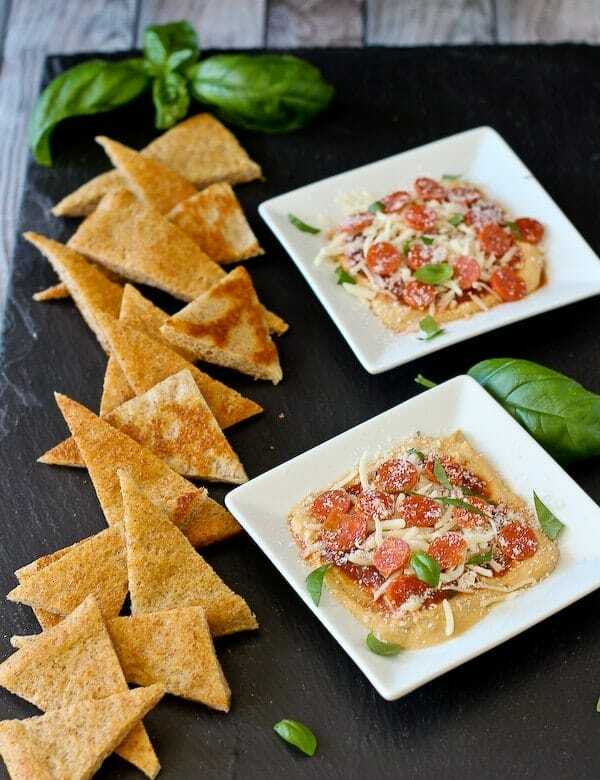 a pizza hummus dip, yes please, this is all I want to eat for dinner! Oh yum! I would inhale this dip faster than the regular slice of pizza. I also did not know that pizza hummus existed. I did not know pizza hummus existed, but now I cannot rest until I try it. And this amazing-looking dip, too!! I really need to get my hands on some of these sabra pizza singles! 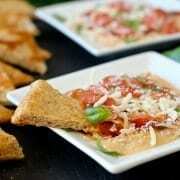 and this pizza dip is pretty genius! My kids go back and forth and hummus – but this? This would seal the deal. This dip would not last long at our house!! pizza dip might just be the best dip idea ever! !